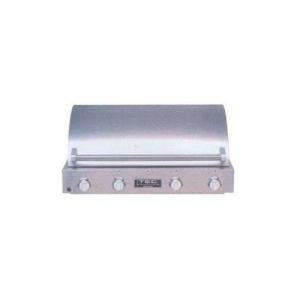 This heavy-duty stainless steel Built-In Infrared Gas Grill, the four burner 68000 BTU G4000 FR from TEC, actually is good enough to literally become part of your home, permanently built into the patio wall if that's where you want it. All the features of the cabinet models are available with the Built-In series as well, giving you customized control of cabinet and counter space and decor. The four infrared burner system starts you off with 764 square inches of evenly heated grilling area, with a removable warming grid that contributes about 300 square inches more. Beneath the grid are the most important innovations -- the stainless steel cooking bars rest directly on a ceramic radiating surface, heated by the four specially designed radiant burners below. Hot air from the burners does not directly contact the food, preventing the drying issues as well as the flare-ups that are common with other systems. Wood chips can be placed directly on the heating plates to give food that natural smoky taste. Fuel efficiency has also benefited from this advanced design, which uses sixty percent less gas than its closest competition. Many fine accessories are available, including griddles, woks, steamers and deep fryers -- the rotissierie available as an extra purchase is especially heavy duty, able to hold sixty pounds of meat. Although an installation kit is available with the TEC Built-In, a professional familiar with local building codes should be in charge of the project. TEC provides detailed instructions for a safe and long-lasting fit, backing up this model with a lifetime warranty on cabinet, five years on the burners, and one year on minor parts.